We headed back to Freetown from Bo, passing mud brick homes with thatched roofs. The road from Bo to Freetown is completely paved, so it’s an easy trip. We visited the farm in Waima yesterday with Billy Simbo and Randy Fennig. They’re doing a lot of experimental stuff to find out what works best. Randy has a great team working with him, mostly young guys keen to learn and be discipled. From there we visited the village of Waima. Kids were either all over us or running in the other direction. We had a lunch they prepared with rice from the first harvest. Later in the afternoon we visited Mattru Hospital. It was good to hear of people that have come to Christ recently and of the improvements being made with help from Global Ministries, the First Lady’s Foundation, and the United Nations. We had a serious discussion about the need for reports and financial updates, and they responded very well. The new doctor’s name is Dr. Skahr Lemgor. Rev Tom Macavoray of Riverside UB is the acting administrator. This morning we visited briefly with Rev. John Labor and greeted Rev. Emmanuel Farma in Bo. We also met with some of the UBC leaders and discussed the water filter project that Brian and Gail Welch have proposed. 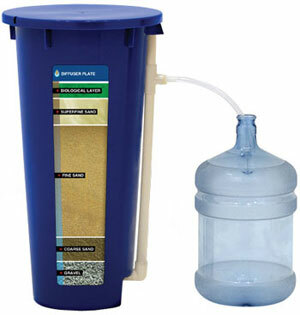 The conference is very interested in helping to work with towns, villages, hospitals, schools, and orphanages that could benefit from the placement of sand filters. Due to the need to periodically maintain the filter, volunteers from local churches will need to make regular visits. It is hoped that the contact from UBC members will lead to opportunities to share the gospel and even plant new churches. After this meeting we met with the president of the Rotary Club in Bo. Wil Kline, member of the Rotary Club in Huntington, Ind., delivered greetings and some small gifts. We delivered a proposal from the Welches that would link US and Sierra Leonian Rotarians and result in some matching grants to further support the water filtration project. We’ll be having lunch with the Fennigs and Billy Simbo in Jui to continue discussing the agri-business projects and other business-as-mission initiatives. Randy and Toni have really thrown themselves into their work at the Evangelical College of Theology and the farm project. They are mentoring students and workers everywhere they go and are making an impact on people’s lives. Jeff Sherlock and Wil Kline have also been a real blessing. Our first few days we spent a lot of time listening and asking questions, but it seems the creative juices are flowing at this point, and we’re having great discussions about both the near and distant future. Things all seem to be falling nicely into place at every stop. We can certainly tell that we are being prayed for and that God’s hand is upon us. Arek and Donna Delik (right), endorsed missionaries serving with Operation Mobilization in Kutno, Poland, sent this report. Janek, our co-worker, who is now taking care of the church, had a serious car accident two weeks ago. We received this news when we were in Thailand for an Operation Mobilization conference. On March 14, Janek took Peter (an alcoholic) from Kutno to Teen Challenge (about 400 km from Kutno) to receive treatment. Teen Challenge is situated in the middle of a thick forest. As Janek turned into the forest, he lost control on the icy road and hit a car, with four passengers, coming from the other direction. The van was totally smashed and Janek lost consciousness for awhile. To his horror, he couldn’t move his neck when he woke up. The police and ambulance came to the scene very quickly and took Janek and 2 ladies from the other car to the nearest hospital for emergency treatment. Janek had a big wound on his forehead and received 10 stitches, and worst of all C1, C2, and C3 vertebrae were broken. One lady had a fractured leg while the other had a broken hip. After stabilizing their conditions, they were all transferred to the main hospital in Gdansk 200 km away. A week later, Janet was discharged to his home in Kutno. Robert McCoy, a former associate pastor of Jerusalem Chapel UB (Churchville, Va.), passed away March 27. His widow, Shirley, lives in Woodlawn, Va. I had the privilege of meeting with Brian and Gail Welch of Fremont, Mich., earlier this year. The Welches were missionaries in Mattru for three terms. Gail was an RN at Mattru Hospital, and Brian taught at Centennial Secondary School in Mattru. Through their non-profit organization, CoolWater, Brian and Gail are working to set up family and community water filters in places like Sierra Leone. They decided to focus on water filter projects due to the high mortality rate among children and the difficulty of providing safe drinking water in many villages, hospitals, and orphanages. CoolWater would like to place filters in small villages, schools, hospitals, and orphanages. The cost is about $60 per unit, plus $40 for shipping. The Rotary Club is providing matching grants, and the Welches are working on other grants as well. CoolWater has raised $4000. They would like to initially send 150 filters to Sierra Leone. My suggestion to Brian and Gail was to first consult with Billy Simbo and see if there is any interest from the Sierra Leone Conference. In order to be successful, training and maintenance of the filters is required. Aside from ensuring access to safe drinking water, this might also be a tremendous “in road” for evangelism and church planting in some villages and small towns. A volunteer from a neighboring UB church would set up the filter and provide training regarding its use. They would then make regular visits to check on the filter. As the relationship builds, the doors for sharing the gospel might also be opened. Mabel Mundy, who has worked at the national office since 1987 (most of that time in Global Ministries), became a great-grandma this morning. L-r: Jeff Bleijerveld, Jeff Sherlock, and Wil Kline. Jeff Bleijerveld, Jeff Sherlock, and Wil Kline arrived safely in Sierra Leone late Sunday night. Their flight out of London was delayed by three hours, so they didn’t reach Freetown until 12:30. Mrs. Lillian Iris Kent, 92, widow of the Rev. Archie Kent, passed away Saturday morning, March 27, 2010, at the Columbus Regional Hospital in Columbus, Ind. She was a member of the Rugby United Brethren church in Hope, Ind. The Kents served Indiana congregations in Anderson, Alexandria, Rugby, Huntington, Warren, New Castle, and Williamsport, as well as in Sherkston, Ontario. Lillian was born in Toronto, Ontario, in 1918. Both visitation and the funeral will be held at the Norman Funeral Home in Hope. It is located on the southwest corner of the town square on State Road 9. Visitation: 4-8 pm Tuesday, March 30, and 10-11 am March 31. Funeral: 11 am Wednesday, March 31. Rev. Tracy McIntyre will officiate. Burial: At the Hawcreek Cemetery. Memorials: To the Aging and Community Services of South Central Indiana. Online condolences may be sent to the family. Jeff Bleijerveld, Director of Global Ministries, leaves for Sierra Leone tomorrow, March 27. He’ll be joined by two members of the Global Ministries Leadership Team, Wil Kline and Jeff Sherlock, both from College Park UB church in Huntington, Ind. They’ll return the following Saturday, April 3. Meet with Global Ministries missionaries Randy and Toni Fennig to see the progress of the agricultural development projects, and visit the farm at Bo. Visit Mattru Hospital to see the progress of various projects there. Talk to Sierra Leone leaders about a possible water filtration project. At the time of this writing, I have now finished the first day of my second week at Pui Va school. Things have been great so far. In week one, I got to meet the 200 students, spread across four classes, that I will work with for the final 10 weeks of the semester. I shared a bit of my story and experiences with the class to give them a chance to get used to the way I speak English. After a few questions to confirm comprehension, I conducted a survey so that I could get a sense of their English level along with some suggestions for what they might be interested to study. The school has given me freedom to teach however I choose, as long as the students are learning conversational English. I wanted some feedback so that I could create engaging and valuable lessons. On each of my last two trips to Macau, I have had the chance to spend a day walking around the old parts of town with Living Stone members Jeffrey, Carolina, and Tyrone. All three of these friends have spent parts of their lives living in more Western cultures. Jeffrey attended high school and university in Canada, Carolina lived in England for a number of years, and Tyrone is from the Philippines and has traveled a lot of places for work. This past Saturday, the four of us decided to head out on the town again, talking in our usual jumble of Cantonese and English. We ate at a Mexican restaurant (surprisingly good) and then walked around Taipa for several hours. Finally, we stopped to get something to drink and ended up sitting and talking about culture and language (including a small competition on who knew the most world capitals) until after 2 am! Even though it took me a few days to catch up on my rest, it was a wonderful opportunity to build friendships with people at Living Stone Church. While I am attending Living Water Church on Sunday mornings, I am happy to be able to connect with the people of Living Stone during the week. On March 16, Roger Reeck had arthroscopic surgery on his knee in Mobile, Alabama. Marilyn reports that it was successful. The orthopedic surgeon feels that there is only a 40% probability that he will need the second surgery. He will remain in the US for a month doing heavy exercises to strengthen the muscles, and after that a decision will be made. In the meantime Marilyn will remain in Honduras working on projects involving the Garifuna language.